This is Down On The Street Bonus Edition, where we check out street-parked cars located in places other than the Island That Rust Forgot. I've got Colorado photographs aplenty, so get ready for high-altitude survivors! Put On Your Coorsskin Cap: Down On The Golden Street! 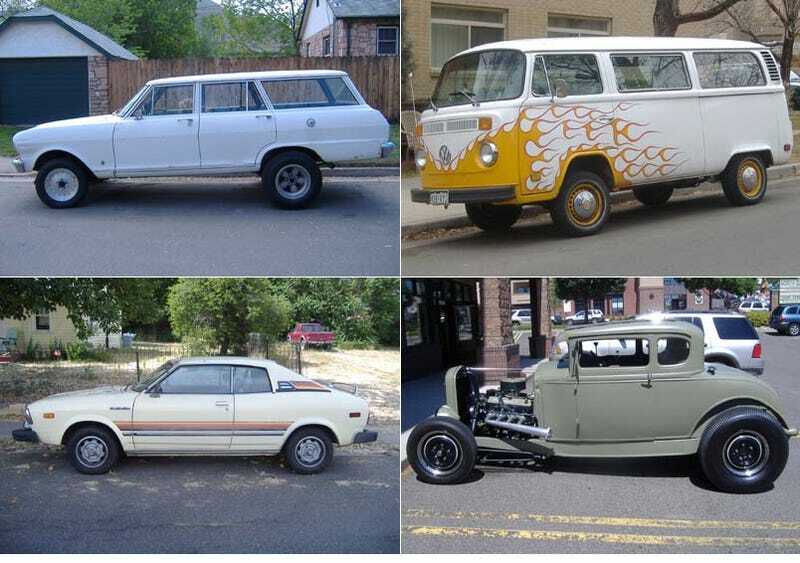 Nova Station Wagon: I've got a couple of good DOTS cars here for you. First up is a 1962 (or maybe '63) Chevrolet Nova station wagon gasser. I talked to the owner, Mike, who also owns a 1946 Austin hot rod and takes both cars out to the local Bandimere Speedway for Wednesday night drag races. The Chevy sports a 327 small block, not the stock I6, and has a killer stance in my opinion. More photos of an IH Scout coming soon. International Harvester Scout: About a block away from the Chevy was this International Harvester Scout in fairly good condition. All I know is that it's driven by a School of Mines student and that it was probably built between 1965 and 1970. Subaru Leone: I finally got around to photographing this Subaru today. From what I can tell, it was made between 1975 and 1978 and has every Malaise-tastic tape stripe and chrome option checked off (along with "5 speeds" and "Front Wheel Drive"). It looks like a pretty competent little daily driver though. Now I just need pictures of the much rustier BRAT last spotted at Taco Bell. Volkwsagen Beetle: I saw the Beetle you posted for DOTS a few days ago with the engine cover propped open, and it reminded me that I needed to photograph this flat-black Beetle. I'm not sure of the year; it's probably from the mid 70s. Whatever the vintage, I think it captures the spirit of a college car pretty well: the Libertarian party bumper stickers, subtle yet somewhat half-assed mods, and the pile of crap where the back seat used to be. You also might note that it's parked on Illinois St, right in front of the MG from the original DOTS Golden post. Toyota Starlet: I saw this Starlet parked on the street while on my way to a friend's house, and knowing the love that many Jalops have for the little Toyota I had to snap a few pictures. From what Wikipedia tells me this is an 81-84 model, and from what the bumper sticker and rust can tell me this little car has been driven hard through Alaska and Colorado since the Reagan years. Ford Model A: I hope I'm not sending you too many photos from Golden, but I couldn't pass up this great vintage-styled hot rod I saw in a parking lot today. It's a 1931 Ford Model A (although the owner wasn't sure exactly what year it is, the title is for '31) with a chopped top, a 302 Ford V8, and some sweet pinstriping, all sitting on a '32 Ford frame and bias plys. I love all of the little details like the structural wood and fabric in the roof, flat green paint, dropped axle with hairpins, and the lakes-style pipes. Probably one of the oldest cars I've seen around Golden this year, and definitely one of the coolest. Ford Thunderbird: I've got a couple more DOTSBE cars here for ya. The first is a beat to hell old Thunderbird I caught being transported on a flatbed, parked in front of this creepy industrial building. Whether its destiny is a full restoration or The Crusher, we can only guess. Volkswagen Transporter: The second car is a newer VW Bus with a wikkid flame paint job, photographed near where I found the MG previously. The paint and aftermarket exhaust give it cool points in my book; however it also looses a few points because of the PRNDL between the seats. From the stickers on the back window, I infer that the owner (or previous owner) is a Christian, works on power lines, and has been a student at the Colorado School of Mines for the last three years or so.